Mitchelton-Scott's Matteo Trentin has taken the victory of the second stage at the Volta a la Comunitat Valenciana. Edvald Boasson Hagen kept the GC lead. The second stage of the Spanish race started with an escape of eight that Dimension-Data made sure to keep at a good distance. In the second part of the day, Mitchelton-Scott and Astana joined the front of the peloton to catch the escape group, which at the end they did with 50 kilometres to go. In the last part of the final ascent, one of the main candidates for the day Dylan Groenewegen was dropped. The teams with sprinters took advantage of this situation and accelerated at the descent, meanwhile, the Jumbo-Visma riders worked hard for the sprinter and at the end managed to bring him back, but the energy spent in the chase took its toll at the last moment of the stage. The peloton rode a very high speed in the last ten kilometres, which caused a cut but everything came back together for the final sprint. The European champion Matteo Trentin entered the last curve with a slight advantage that gave him the victory of the day, while Cofidis' Nacer Bouhanni and Team Sky's Ben Swift crossed the finish line in second and third position respectively. 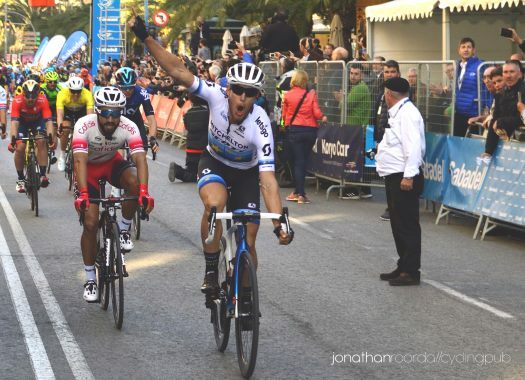 "It feels really good, especially because I was working really hard during the whole winter and actually seeing the whole team so committed on this first road stage, the first race for us in Europe, it gave me that extra motivation for sure," said Trentin at the end of the stage. "I was feeling good, my numbers in training have been alright but numbers and racing are two different things. Today I was never struggling, I was surfing in the wheels and in the final, I think I pulled up a really good sprint coming at the right moment, in the right position, so I am really happy." Dimension Data's Edvald Boasson Hagen was the fifth rider at the finish line, which let him keep the lead of the General Classification for another day. The first abandon of the race came from CCC Team as Michael Schär didn't start the second stage because of gastrointestinal problems.